At the moment of explosion, Sinniti Ttsutani (3 years and 11 months) was on the bike near his home. The boy was critically burned and died a few hours after the explosion. His father had buried the remains of his son together with the bike. Forty years later, relatives of Sinniti reburied his remains in the family grave, and the bike was transferred to the Hiroshima Peace and Culture Center. This rusted bicycle has become a symbol of the tragedy. There exists a very somber solution to the Fermi paradox, which is in the absence of radio signals or the traces of existence of other intelligent civilizations in the universe. In the light of the discovery of numerous potentially habitable planets, it seems more and more strange. One of the paradox solutions states, that every intelligent, technologically advanced civilization (which has approached to the cosmic era) destroys itself in one or another conflict or technological disaster. Taking into consideration the development of modern technologies and globalization, it seems impossible. Though, it is necessary to pay attention to the fact that it takes only 20-30 minutes for the ICBM intercontinental ballistic missiels to approach. A simple press of a button can make our usual world disappear in the nuclear fire in a mere 30 minutes. About sixty years ago, the US goverment visually demonstrated the world the effect of the atomic bomb, even thought by modern standarts this weapong considered to be crude and low-powered copared to modern nuclear and thermonuclear ammunition. Was it justified or even nececary is up to you to decide. Warning! 18+ These series of photos show the consequences of the nuclear explosion, including major injuries, death, agony and human remains. Underage and sensitive people are not recommended to read this materials. In every culture there are a lot of interesting, and sometimes curious traditions and superstitions related to pregnancy and childbirth. The Country of the Rising Sun is no exception. In the past, careful observance of the rituals was the key to a successful delivery, but now the Japanese attach less importance to the rituals, preferring the qualified medical care. People end their lives for different reasons but usually suicide is an escape. Escape from pain, humiliation, fear, shame, traumatic events. There are many things in life that might push a person to the edge. It is no surprise that in Japanese society, where exist so many social rules and complicated relationships, the suicide rate is relatively high. From a foreigner’s point of view, some of the issues that push Japanese men and woman into such a desperate move may look strange or even ridiculous. Unlike the U.S., in Japan the majority of people who commit suicide are of young to middle age, healthy and with better than average social status and income. 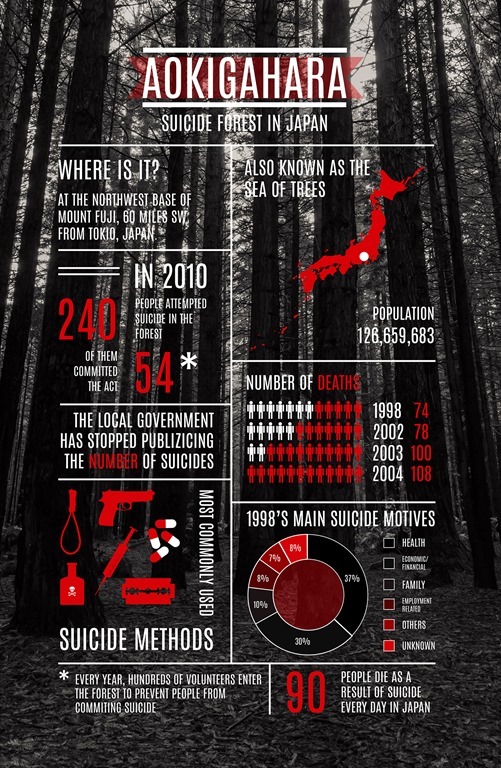 Yet, many of them decide to die and come to the Aokigahara forest near Mount Fuji to take their lives.